Bush flies are native Australian insects. Early European explorers of the west coast of Australia such as Dirk Hartog (1616), sailing for the Dutch East India Company, and the British privateer William Dampier (1699) reported that bush flies were a huge pest, bothering the mariners and the locals alike. This would have been the bush fly, Musca vetustissima, breeding mainly in human and dog dung. At that time, the largest herbivores in Australia were the kangaroos, which produced the hard, dry pelletised dung to which the Australian native dung beetles (of which there are nearly 500 species) were well adapted. When Governor Phillip arrived in Botany Bay in 1788 he brought with him five cows and two bulls: this began a radical transformation of the Australian landscape because most Australian dung beetles are poorly adapted to dealing with large sloppy cattle dung pads. So most of the cattle dung remained unburied. This provided an ideal breeding medium for the native bush flies. Today in Australia there are 28.5 million cattle, each producing about 12 dung pads per day. Forty years ago most of this dung remained unburied and bush flies and other pests bred in it. One big cattle pad can produce 2000 to 3000 flies, so the problem was immense, with billions of flies produced each year. 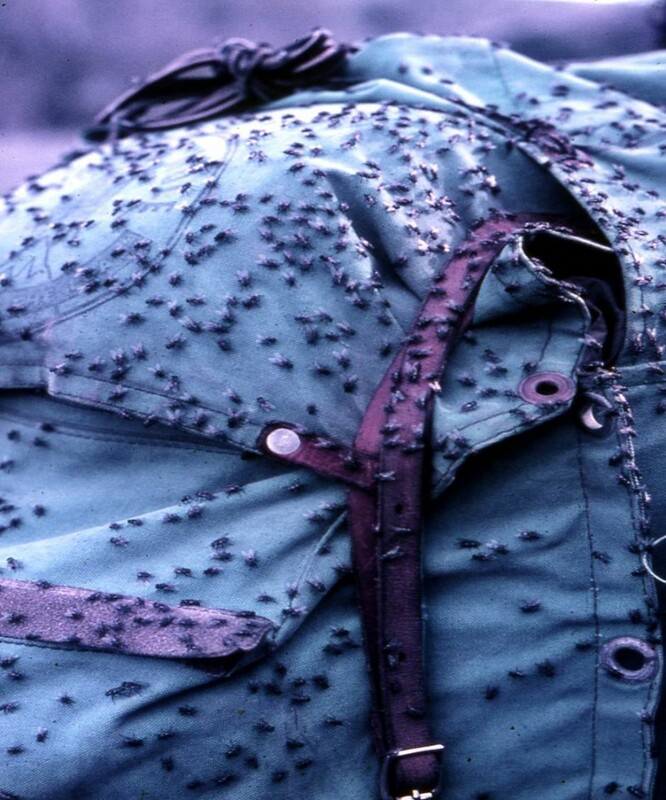 The flies seek moisture and protein, both of which they get from sweat, saliva, eye secretions, wounds etc. and so, when many hundreds of flies bother each person (as used to happen) they are a serious pest. These flies pestered city and country folk alike, because they are highly mobile and city limits are no barrier to them. Al fresco dining was impossible. Fly nets on hats were a common sight. Before the 1960s bush flies were a serious pest across southern Australia in spring, summer and autumn but were not a problem in winter because they went locally extinct each year. Each spring they migrated back again in their millions, carried south on warm winds, and bred in the fresh green spring dung of cattle. Bush flies lay their eggs in cracks and crevices around the base of dung pads, and that is where dung beetles do their work. They stir up the dung and this commonly smothers the eggs, which then drown. Any that survive hatch into maggots (larvae). Fly maggots feed on the juices in dung pads. 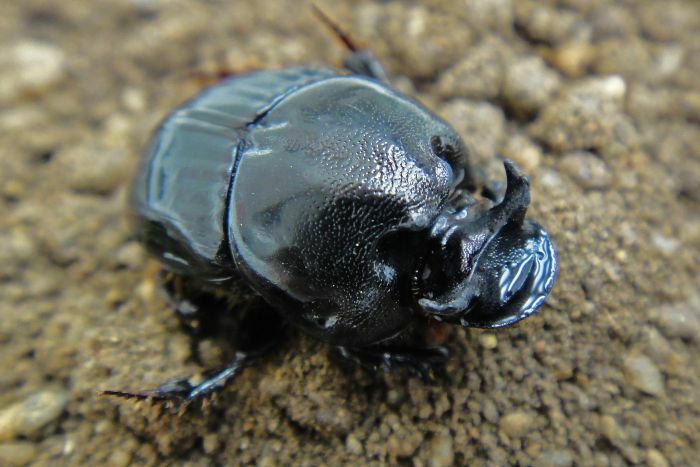 Adult dung beetles also feed on juices in dung pads. 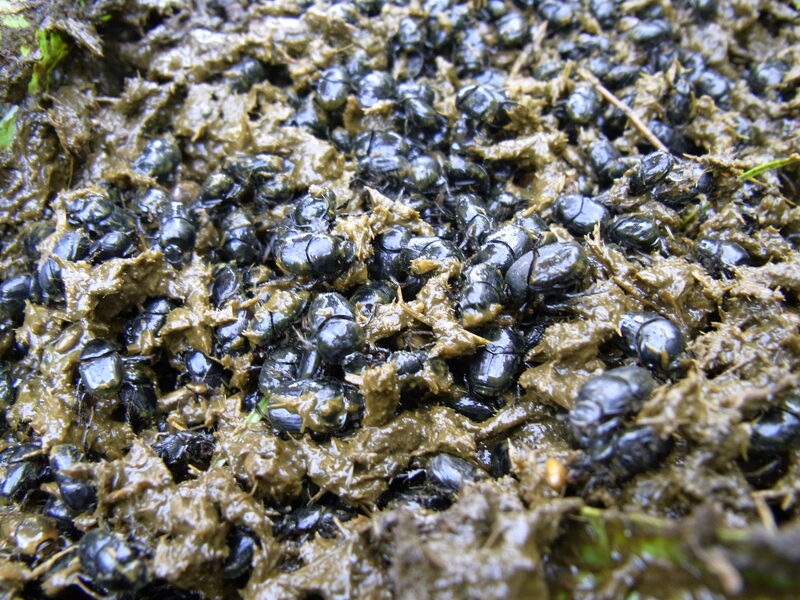 When there are several thousand dung beetles in a pad (which commonly occurs in southern Australia during summer) the beetles use up all the dung juices in a day or so and leave behind dry dung fragments, leaving no food for the fly maggots. And so the maggots die. This solves the dung-breeding fly problem in summer. The introduction and widespread establishment of the European dung beetles Onthophagus taurus and Euoniticellus fulvus and the south African Onthophagus binodis in the 1970s led to the virtual disappearance of bush flies in the moister regions of southern Australia during summer and autumn. But, in places, the bush fly remains a serious pest in late spring and early summer. 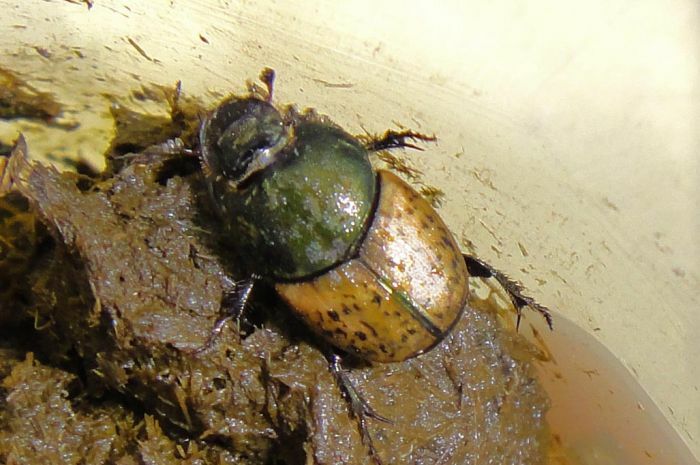 So in 2011 CSIRO introduced two more dung beetles, the spring-active Onthophagus vacca and Bubas bubalus from France. 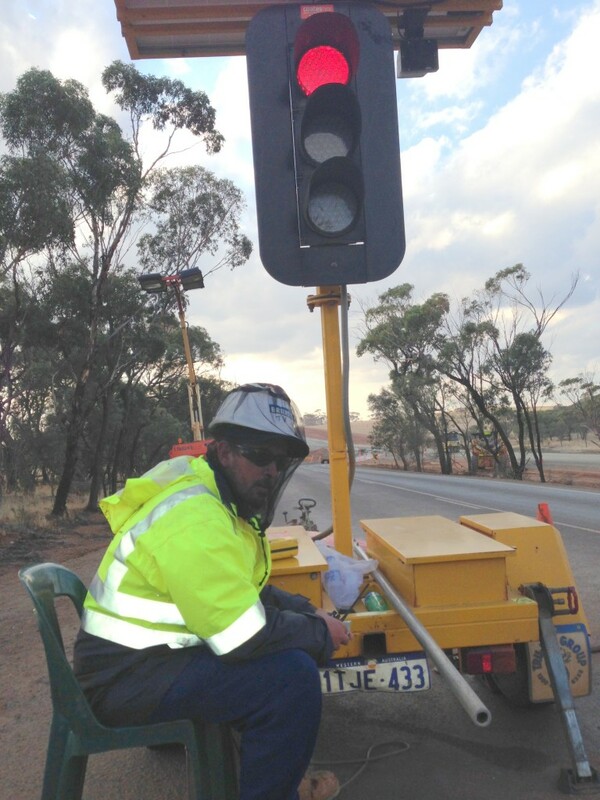 A very small number were sent to South Australia where we (Dung Beetle Solutions Australia and Creation Care, a local environmental company) began breeding them. These are currently in mass rearing field nurseries in South Australia. We are likely to have several thousand of both species in spring 2017. Some of these will be released to breeding paddocks, while others will be retained for further mass rearing. Over the next 2–5 years we expect to see tens of thousands of these two spring dung beetle species distributed to cattle properties across southern Australia, where they will breed up and disperse (fly) to neighbouring properties. In a decade both species of dung beetle are likely to be abundant in many local regions, thereby resolving the spring bush fly problem. Dung-breeding pest flies are not a problem in France or in South Africa, where the activity of local dung beetles keeps them under control. To find out if the new spring beetles will be suitable for your property, please contact us.